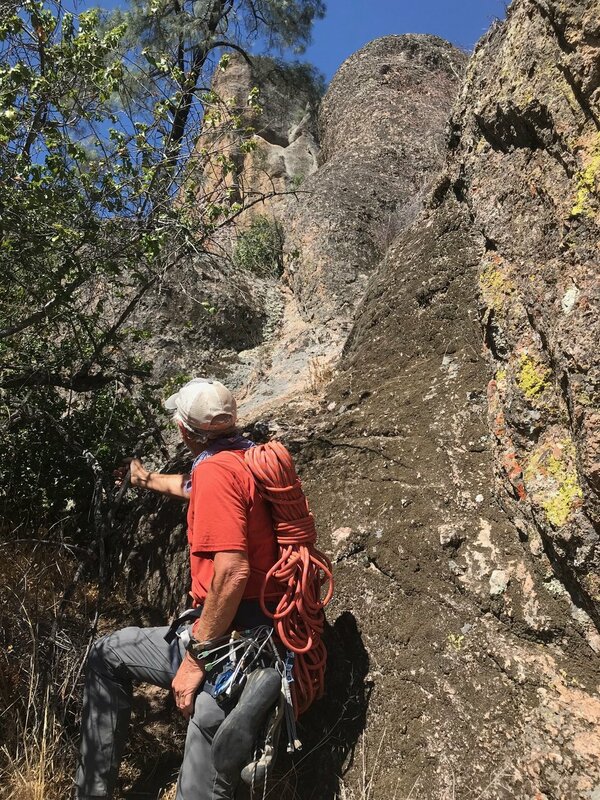 Pacific Edge employees Mike Kittredge and Carl Pearson headed to Pinnacles National Park to find and climb Feather Cayon 5.8. This 8 pitch “alpine like” adventurous route sees little human traffic, but is a hidden gem in the park. 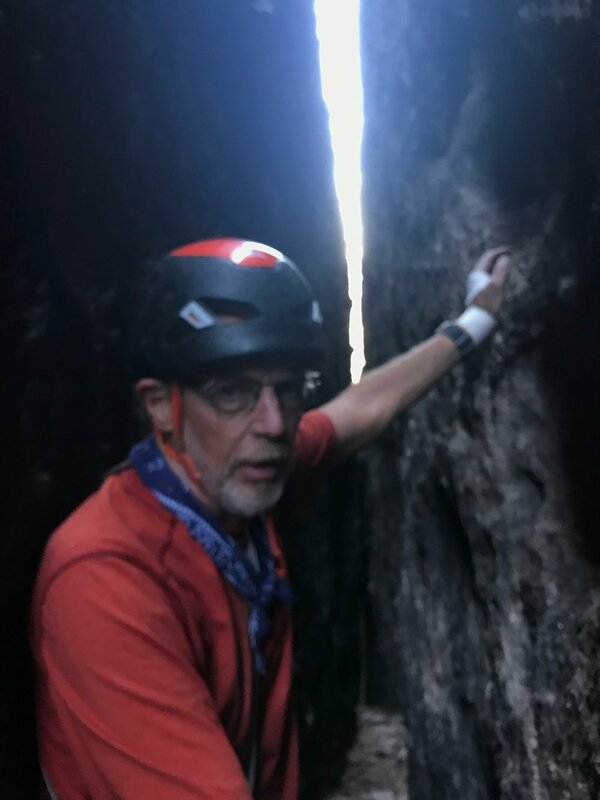 After a difficult approach the climb starts in a cavernous chimney with wild stemming. It then moves to “face climbing” and a bit of challenging route finding above. At the top of pitch 3 we had the unique opportunity to meet Condor #92 up close and personal as he first appeared overhead, then swooped down and landed right on top of the chalkstone which needs to be traversed to finish the pitch. #92 was determined not to move an inch so we had a face to face encounter. Amazing! 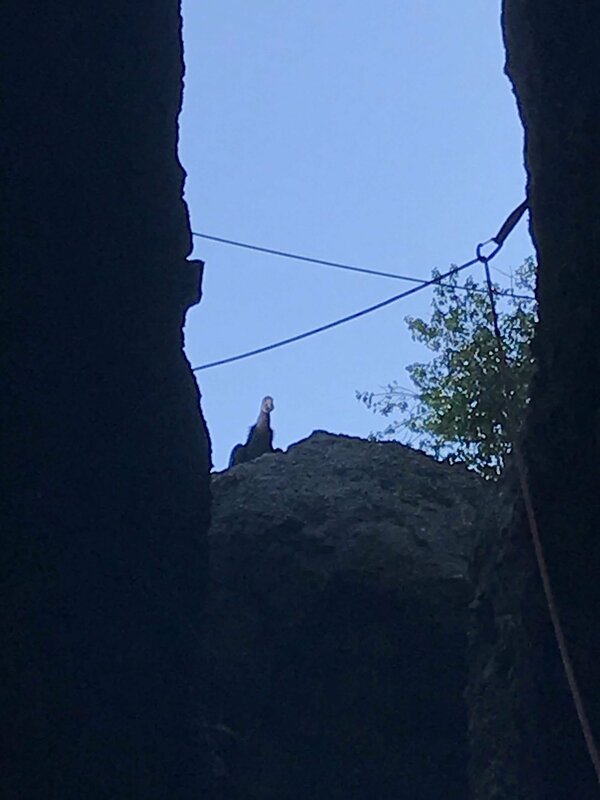 At the belay for pitch 6, Condor #692 was patiently waiting for us. We guess he didn’t get enough of us down below, or perhaps worse, he was hoping for an easy meal of a climber. Carl’s a bit older, so he didn’t appreciate humor. Regardless, as responsible climbers, we of course didn’t want to harass an endangered species. After a long “conversation” with #692 and a minimal amount of gentle encouragement, he moved away enough so we could finish our climb. All in all, it was a great climb and a once in a lifetime experience to be so close to such an amazingly large raptor. We encourage anyone reading this to learn more about Condor restoration by visiting the below websites. Pacific Edge advocates responsible climbing and leave no trace principles. Please climb responsibly. We hope you enjoy these pictures from a once in a lifetime face to face meet up with #692. 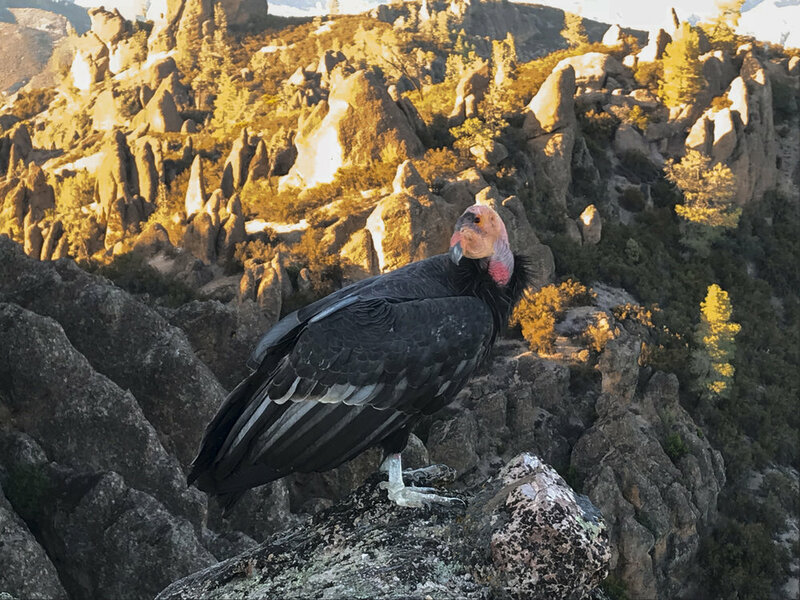 UPDATE: After we shared this experience with the national park service, they wanted us to be sure we infom folks to never approach a condor if one lands near you; “we (the Park Service) don't want the birds to feel comfortable being close to humans"
So as a reminder to all of us who are climbers and outdoor enthusiasts, part of enjoy nature is giving wild animals their space, never feed them, and pack out what we pack in!